I got this idea from the TD Summer Reading Program – School Age Programs and it turned out to be a fun program and a definite repeat for future years. I collected a variety of magazines including Teen Vogue, Seventeen, National Geographic, Parenting, and Arts and Crafts. I chose about 30 words (but we only did about half of that). I told the kids that they had 60 seconds to find the following item in the magazines. Some of the words I chose were: wedding, baby, name of a country, pet animal, recipe, car, flower, pair of jeans, sunglasses, watch, iPhone, bird, book high heels, Nicki Minaj, something orange, one direction. The last word I told them to find was letters that spelled out L-I-B-R-A-R-Y. 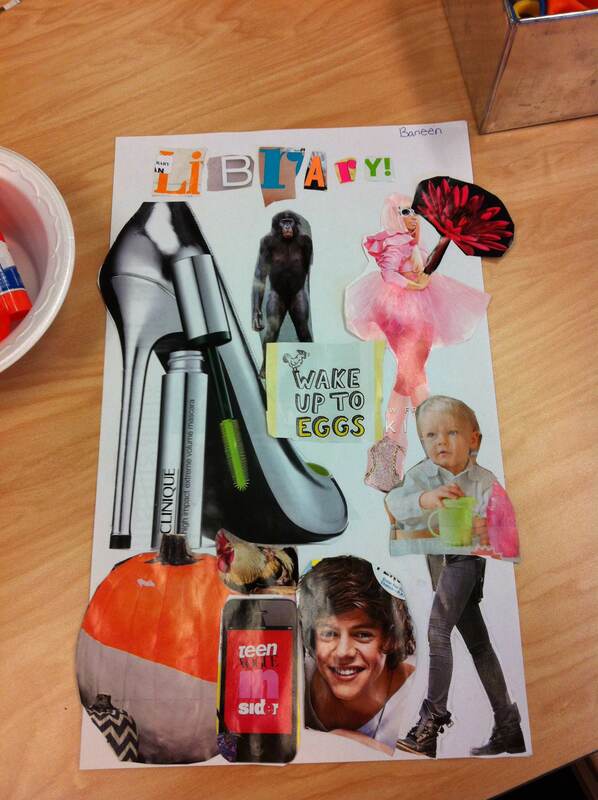 After we got the all the items cut out, I told them to invent a collage. Information literacy! It got the kids to look at the magazines and figure out what was in them. For instance, while looking for an animal, one of the kids was looking in Seventeen magazine. I told her to look at what each magazine is about, and then dig in. By the end of the game, they were assessing the word and then finding the appropriate magazine to search. Not to mention, it’s CHEAP!